"I spent the afternoon in a bookstore. There were no books in it. None had been printed for nearly half a century..."
Amazon.com has announced that it has sold more ebooks than hardcover paper books during a quarter for the first time ever. Amazon says that it sold 143 kindle ebooks for every 100 hardcover books. The pace of change is quickening, too, Amazon said. In the last four weeks sales rose to 180 digital books for every 100 hardcover copies. Amazon has 630,000 Kindle books, a small fraction of the millions of books sold on the site. The growth rate of Kindle sales tripled after Amazon lowered the price of the device in late June to $189 from $259, Amazon said. 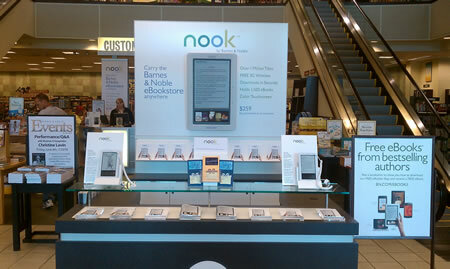 That was moments after Barnes & Noble dropped the price of its Nook e-reader to $199 from $259. This futuristic sight can be seen in your local bookstore as well.